The department is the second level of administrative divisions on the map of France. The department of Territoire de Belfort is located in the region of region of Franche-Comté. The department of Territoire de Belfort has the number 90 and is divided into 1 districts , 15 townships and 102 municipalities. 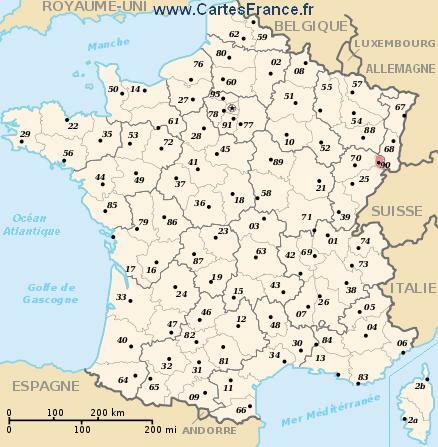 Below you will find the localization of Territoire de Belfort on the map of France, and the satellite map of Territoire de Belfort. Inhabitants of Territoire de Belfort were 137 408 in the 1999 census and 141 201 in the 2006 census. Area of departement of Territoire de Belfort is 609,44 km ². Population density of Territoire de Belfort is 231,69 inhabitants per km². Biggest cities of department of Territoire de Belfort, in number of inhabitants, are (2007 census): Belfort, Delle, Valdoie, Beaucourt, Bavilliers, Danjoutin, Offemont, Giromagny, Grandvillars, Essert, Châtenois-les-Forges, Évette-Salbert, Bourogne, Cravanche, Étueffont, Chèvremont, Rougemont-le-Château, Méziré. You will find the towns list of Territoire de Belfort in the bottom on this page. You can consult the map of France, pictures, hotels, and all data of every town and village in the department of Territoire de Belfort clicking on these towns links. Search hotels of Territoire de Belfort : Book your hotel now ! Where is located the Territoire de Belfort department ? The department of Territoire de Belfort is located in the region of Franche-Comté. 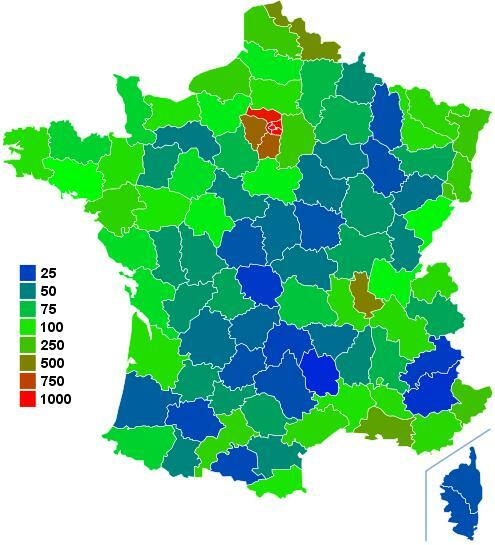 Territoire de Belfort is in red on the map of french departments. What are the statistics and key data of Territoire de Belfort ? The department of Territoire de Belfort has the number 90. It is composed of 1 districts ("arrondissements") , 15 townships ("cantons") and 102 towns ("communes"). The 1 districts of the department of Territoire de Belfort are : Belfort. The inhabitants of of Territoire de Belfort were 137 408 in 1999 and 141 201 in 2006. The area of the department of Territoire de Belfort is 609,44 km ². Population density of the department of Territoire de Belfort is 231,69 inhabitants per km². What are the largest cities of the department of Territoire de Belfort ? The largest cities of the department of Territoire de Belfort (compared to the number of inhabitants in 2007) are : Belfort, Delle, Valdoie, Beaucourt, Bavilliers, Danjoutin, Offemont, Giromagny, Grandvillars, Essert, Châtenois-les-Forges, Évette-Salbert, Bourogne, Cravanche, Étueffont, Chèvremont, Rougemont-le-Château, Méziré. You can zoom the satellite map of Territoire de Belfort to see a village or a city, for example Belfort. Records of the Territoire de Belfort department: Did you know ? Follow the links of towns and cities of the Territoire de Belfort department and see photos, maps, and informations for these towns.